Detail from "Deep Sea Bead Harp,"
Cynthia Houghton, a young artist who joined the Brattleboro arts community a few years ago, has a succinct and expressive style of sculpture-making which is both original and viewer-friendly. When abstraction works for the viewer, the form or materials are sometimes said to "ring bells." If so, seeing one of Cynthia's delicate and quirky biotechnical constructions intones a mental stroke on the xylophone. Her language of forms works well and is reminiscent of insects, skeletal fish, and butterfly wings as well as technical construction and diagrammatic mechanics. Simultaneously she references several historical artists' styles, most notably Joseph Calder but also many of the Surrealists. Her style of work is blended with external stimulae to express herself in an individualistic mode that works visually, being instinctively familiar and intellectually compelling. On this Earth, we are surrounded by natural phenomena, some of which seem impossibly strange and unusual. When certain insects are studied under a microscope, we are surprised to see their curious structures, surprised because the unexpected shapes and patterns in their tiny world seem unfamiliar and exotic. Likewise, if there is a class of life which borders commonly on the surreal in our imaginations, it would have to be those deep, deep sea creatures -- you know, the ones with the lamps on their foreheads or the ectoskeletal Christmas ornamentations -- the ones which seem too weird to be real. It is these types of singular species which we are reminded of by the biological forms in Cynthia's work. In her studio, they hang from the ceiling, suspended as if they might magically come to life once the lights have been shut off, sprouting little bright lights and silently gliding past each other in the darkness. 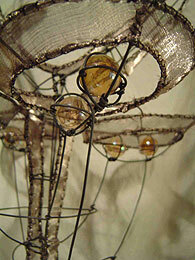 The sculptures are made from wire of varying gauges that is meticulously shaped into complex but fluid forms. These forms are then selectively defined further by the addition of delicate silken fabrics that are stretched onto the shape and sewn in place. The sewing stitches are each as personal as those made by hand in early Native American bags and other cloth articles. The forms recall some of the two-dimensional shapes in pieces by Marcel Duchamp, such as Bride Stripped Bare With Her Bachelors, Even or the Great Glass at the Philadelphia Museum of Art. And, like the father of conceptual art, she animates these shapes by altering their symmetricality slightly so that they imply movement or flux. 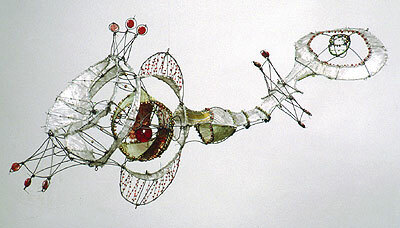 In the newest work, she has added glass marbles and beads to this structure, not merely as ornamental elements but as implied "organs" or bits of "energy." 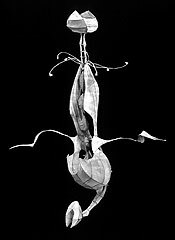 In the small hanging sculpture entitled Deep Sea Bead Harp, silk has been attached to some wire shapes and then the weave of the silk has been manipulated by pushing threads around with a pin and slightly roughing it up. The fabric thus seems aged and as if it had lived. White silk shapes are contrasted by a bit of patterned fabric. Houghton prefers the fabric she selects to be semitransparent so that she may visually retain the integrity of the wire form. In this piece, some covered shapes are protecting a large, ruby-red "moonie gobbler" marble that is "presented" inside. 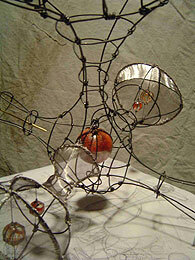 Suspended by the wire, it is the "heart" of the piece. Small glass beads are strung on guitar-string-like wires inside, and flat red glass beads appear on symmetrically placed protuberances. Houghton said she felt a "carnival element" entering the piece during her work on it. "Super Etch-A-Sketch Flight Simulation Booth,"
canvas, and synthetic fibers, 40"x32"x20"
Cynthia explained that her work illustrates the bilateral symmetry occurring in nature. She also identified a National Geographic documentary film as a source of inspiration for the odd, fishlike pieces. 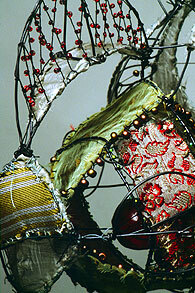 The evolution of her work is also linked to her five-year assistantship at a pottery in Atlanta, Georgia before arriving in Brattleboro. Working in traditional fashion, she was attaching clay to a wire armature when she became enamored of the armature itself. Letting go of the clay, she began working strictly in wire. (Some of those early pieces are still extant.) Soon she began to introduce bits of cloth to define the shapes. The cloth became a structural element that also simplified the composition and unified the piece. Only recently have the glass marbles and beads been added. In this way, Cynthia has followed her instincts and observations well and responded to her passion for certain materials. She has gone around the bases: one, two, three, four -- coming home in good time. Cynthia Houghton has sought to combine both machinelike and organic qualities, these hybrid inventions giving form to her intensely innovative curiosity and expression of a life-worn but inherently delicate sensibility. She did not see the recent show of Lenore Tawny's work at the Brattleboro Museum & Art Center, but there are numerous corollaries one could draw between the two women's styles. There is the hanging element, the worn but delicate quality, and their taste in materials. In Tawny's work, some of the sacred is blended with the exotic but earthy, while in Houghton's the nostalgic and science-quirky transform to a similar "sublime," different in character. 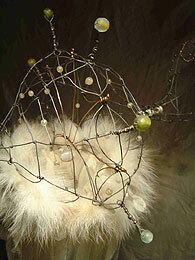 One piece reminiscent of some of Tawny's hanging works is Resonator Helmet, a headdress with a circle of white fur surmounted by a cluster of wires at once both horns and "receptors." Long, trailing strips of silky white fabric hang like a transparent but protective veil subject to slight breezes in the air. It is elegant and shamanic, and quite strong. A member of the Windham Art Gallery (WAG), Cynthia Houghton has also shown work at the former Ballroom Gallery. 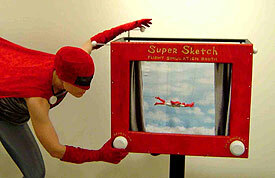 She'll exhibit her Super Etch-a-Sketch as part of WAG's "Off the Wall" May show. Her newest discoveries will be featured at Gallery in the Woods in June -- a show you should be sure to float over to. . . .